I’m a mother of two you know, so sometimes I fall into the trap of thinking I know what I’m at with this parenting lark. Two Christmases ago we had a total meltdown on Christmas Eve because the build up to Christmas went on too long and it all got a bit much for a two year old. Last year we made a few changes. For a start I agreed to wait until December to put up the Christmas tree. I know! I know! 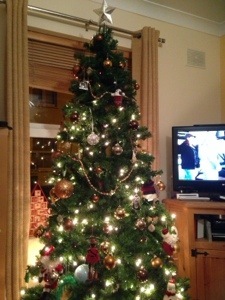 How can you watch the Late Late Toy Show without the tree up? But anyway, we have to make sacrifices as parents, so I relented and the tree went up on December 8th instead. We also bought an Advent calendar – a Lego one. We carefully opened one window each day and used to it show just how many days were left until Christmas. It worked fantastically. This year I had it all sussed from the start. Delay the tree, get a new advent calendar. I found an Imaginext calendar for sale in Smyths for a fiver so that was that sorted. What I didn’t count on was the logic of a four year old. Once again we explained that each window represented a day and that the remaining windows showed how many days were left until Christmas. What’s he gonna be like next year Office Mum? Ah what a clever laddie!, gosh, I love a four year olds logic… Wish I had that kind of wherewithal !! I wonder where we lose it along the way. I guess school knocks that kind of creativity out of you. Especially secondary school. Definitely. That was his plan. Too clever for me Sadhbh.